The Department of Environmental Conservation says Friday it won't issue a water quality permit for the 124-mile Constitution Pipeline from Pennsylvania's shale gas fields to eastern New York. The Federal Energy Regulatory Commission approved the pipeline project in 2014 contingent on the state permit, which is required by the federal Clean Water Act. Constitution Pipeline Company, a partnership formed by Cabot Oil & Gas, Williams Partners and Piedmont Natural Gas Company, can appeal the state decision. Environmental and community groups have pressed Gov. Andrew Cuomo to decline the permit. Some local officials and labor groups argued the pipeline was essential as New York has been increasing its natural gas consumption. Copyright 2016 Associated Press. All Rights Reserved. A proposed 124-mile pipeline to deliver low-cost gas from Pennsylvania's shale gas fields to New York and New England has been delayed for lack of a state water quality permit. 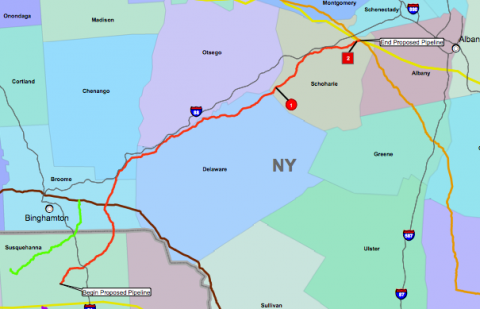 Federal regulators have rejected the Constitution Pipeline Company's request to cut trees in New York along the proposed route of its 124-mile natural gas pipeline before a critical state permit is issued. We’re looking back at some of the stories that dominated 2015 this week — especially the proposed construction of natural gas pipelines. The building of two controversial pipelines could be held up for a year if environmental approvals fail to materialize on time.